The Washington Post is now a stalwart of the national press corps, but, as the movie The Post makes clear, its status was not assured. Neither was the future of the Freedom of the Press in the wake of Daniel Ellsberg’s leaking of The Pentagon Papers in 1971 in what may be the most heralded case of federal whistleblowing. This is a very strong movie. 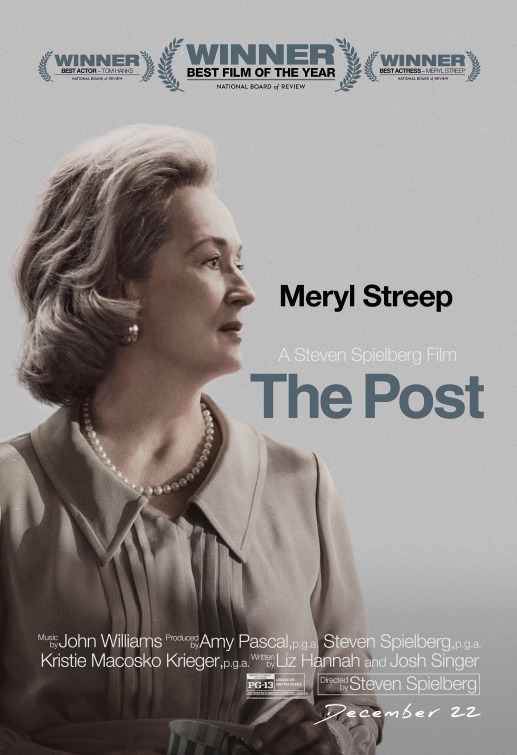 Directed by Steven Spielberg, starring Meryl Streep as Katherine Graham and Tom Hanks as Editor-in-Chief Ben Bradlee, the movie has a tight script, excellent supporting cast, and a message highly relevant to today’s times. My rubric generated a 9.63 on a scale of 10, a solid “A” and the highest score any movie has received from the 2017 crop of films. Reviews at Rotten Tomatoes can be found here. Reviews at Metacritic can be found here.